Caking or clumping is a significant concern in dry fertilizer production, storage, transport and application. Crystallization of water soluble salts and the resulting bridges between the surfaces of fertilizer particles is a common mechanism that causes caking. Pressure from storage conditions can also cause the surface of fertilizer particles to experience plastic deformation, causing their new contact surfaces to experience adhesion from reduced water vapor pressure. Regardless of the cause, fertilizer caking can be highly problematic. 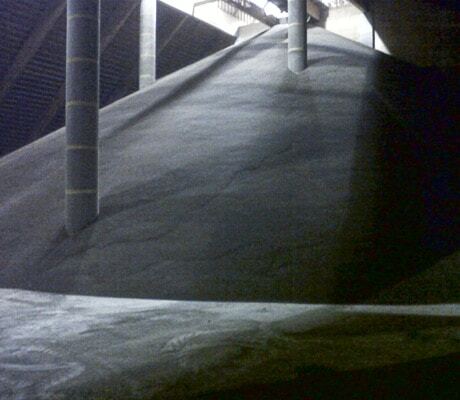 Fertilizers are often stored in open bins in very large bulk quantities and caked product can cause portions of the pile to form unstable “cliffs” of material. Such “cliffs” can be extremely hazardous for operators of mobile equipment digging into the base of a pile since those higher, caked sections of the pile can become dislodged and tumble down like an avalanche. 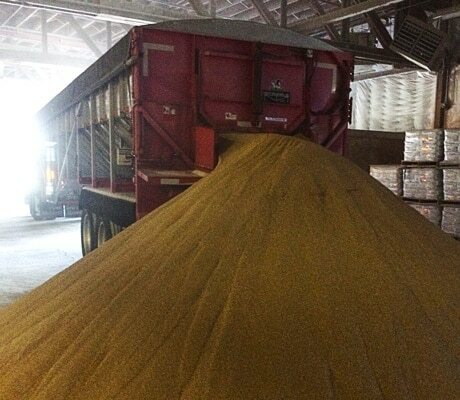 Caked fertilizer in bulk transport equipment can also be difficult to load and unload. It can cause improper distribution in blending or other compounding operations and can damage handling equipment. And when fertilizer is not free flowing, there will be uneven distribution during field application. All of these situations can diminish and sometimes even destroy the value of fertilizer, and in some cases, create safety hazards for workers in the industry. Conditioning treatments for fertilizers may be used to interrupt these caking tendencies, thereby enhancing the product’s value and handling safety. Fertilizer producers can apply an external treatment of an anti-caking agent which contains appropriate surface active agents to disrupt typical fertilizer caking mechanisms. These coatings are usually formulated with other components that reduce the formation of dust, excessive amounts of which can promote crystal bridging which also contributes to caking. 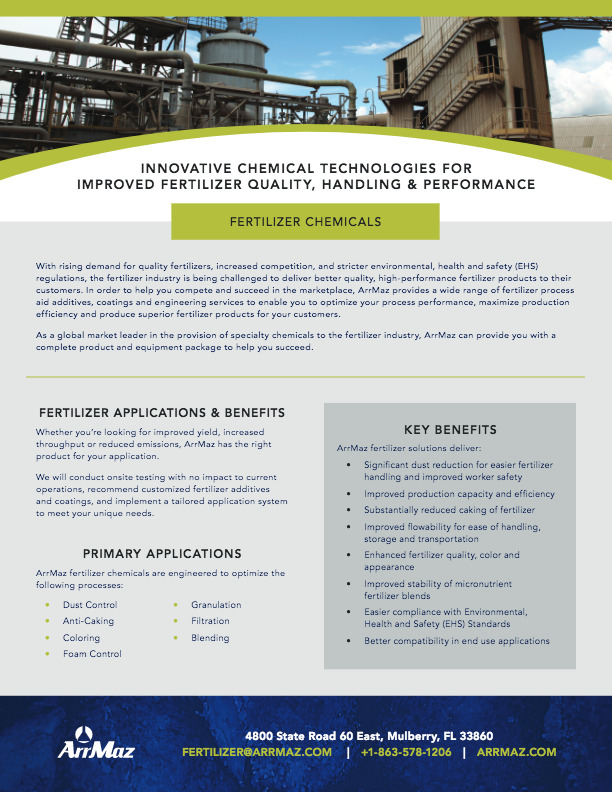 When producers treat their fertilizer adequately with a high quality anti-caking agent which meets these requirements, such as those in ArrMaz’s GALORYL® and DUSTROL® lines, they can be comfortable knowing that they’ve properly addressed fertilizer caking-related safety concerns in their workplace as well as in downstream handling facilities. And when a supplier is able to go to market with an appropriately treated fertilizer product, they will realize the full market value for their product while minimizing the potential for quality claims. ArrMaz will help you select the best GALORYL® or DUSTROL® anti-caking agent and design an optimal coating application system to meet you fertilizer anti-caking needs.